If you want Athletes and Celebrities on TV, you may have noticed that they are suddenly wearing these new Gingham Plaid dress shirts with their suits, that is no accident. 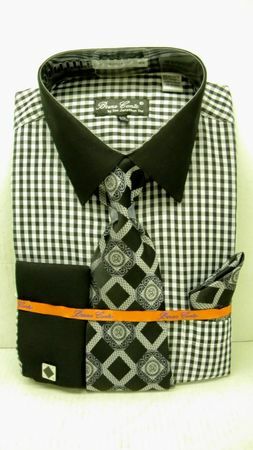 It happens to be the new style for the season and this Black Gingham plaid dress shirt by Bruno Conte will reinforce the style with it's classy good looks and solid black french cuffs and collar with the matching tie set. Fabric is easy care Poly/Cotton blend.